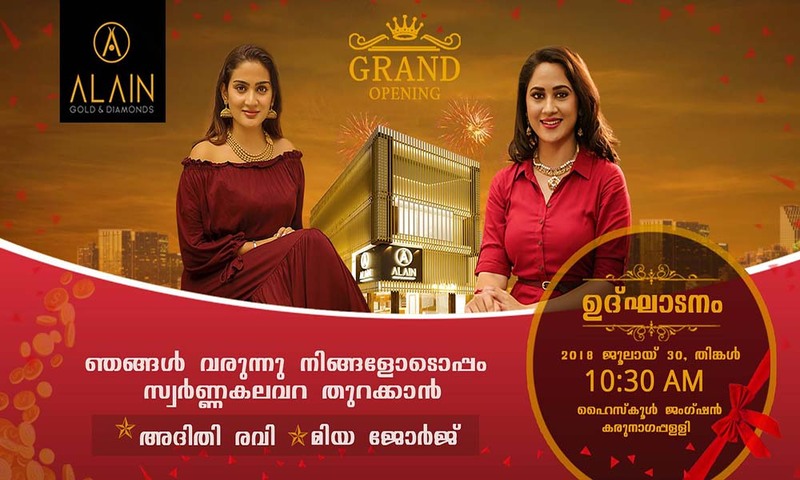 Alain Gold & Diamonds Grand Opening at Karunagapilli, Kollam It’s a collection of traditional antiques, Traditional Temple collection, ancient and modern wedding collections, light-weight ornaments Italian - Singapore ornaments. The inauguration will be hosted by famous film stars Miya and Aditi Ravi on July 30. We all are welcomed into a pure relationship. You will get a golden opportunity to inaugurate the Alain Gold & Diamonds Karunagapilli showroom. Hold coupon with the coupon and deposit it in the box office on the inaugural showroom. Three of the selected candidates will be among the film stars. Be a Part Of The Best !!!!! !